We’ve been having a great time working with Lily and Grow Stonehouse this year; running monthly sessions at Union Corner, a fantastic space with great facilities, to provide an introduction into preserving, as well as creating plenty of tasty and nutritious dishes using some of the produce grown in several of the community spaces around Stonehouse. We have a mix of older local residents, young adults and families with young children. There’s nothing more rewarding than seeing the pleasure on the face of someone trying dishes that they have made for the first time. 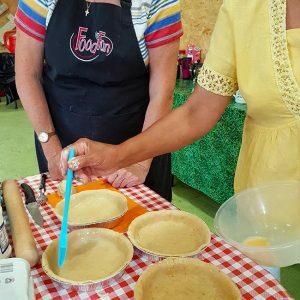 But it’s more than just a cooking session – it’s a social experience and a chance to bring the community of Stonehouse together through food. Monthly sessions will be running up until Christmas, so if you know anyone who lives in the area who could benefit, please direct them to the Grow Stonehouse Facebook page to find out more details.